Anthony W. Jones was born on May 15, 1792, just a little more than three years after George Washington’s first inauguration as President of the United States in April of 1789. Jones fought against the British in the War of 1812. He is listed as a Lieutenant Colonel under the command of General James B. Murray in an original Roll Book, Veterans Corp, War of 1812 for the First Brigade of Veterans of the War of 1812 in the City and County of New York. 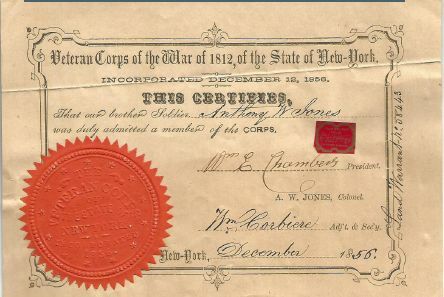 The certificate of his admittance as a member of that Veterans Corps in December of 1856 is shown below. The address given for Jones in the Roll Book was 370 Broadway, New York. It is unknown if that address was just his residence or whether it later also served as an artist studio and work shop. On the 4th of June 1832 he married his second wife Antoinette Douglas. 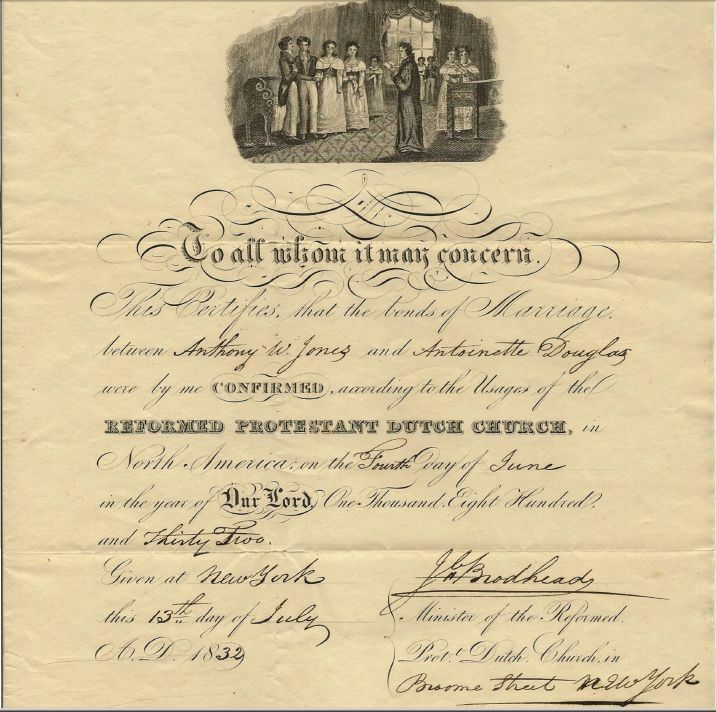 A copy of the Jones/Douglas 1832 marriage certificate is seen below. All works by Anthony W. Jones that are still in our family came down by direct descent from their youngest daughter Sarah J. Jones. A resident of New York City for most of his life, Jones created a 20 inch diameter x 1 ½ inch deep cast iron bas relief self portrait of himself and his wife Antoinette seen below. Anthony W. Jones also created a number of bas relief portraits of prominent individuals of that time. The web site of the New York Historical Society Museum & Library lists several examples of his portraiture work. 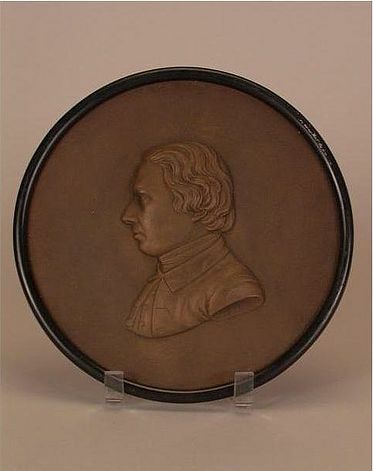 In 1857, for example, Jones completed a plaster and wood frame bas relief portrait measuring 7 ¼ inches (18.4 cm) in diameter of John Pintard (1759-1844). Pintard was an American merchant and philanthropist. He was a founder of both the New York and Massachusetts Historical Societies and also served as an alderman of the City of New York. Pintard was deeply religious. He was a supporter of the General Theological Seminary, and established the American Bible Society. Jones’ round bas-relief portrait of Pintard, was the plaster model for the medal struck to commemorate the opening of the New York Historical Society's building on Second Avenue at Eleventh Street. Reference to this particular work by Jones is located on their web site here. 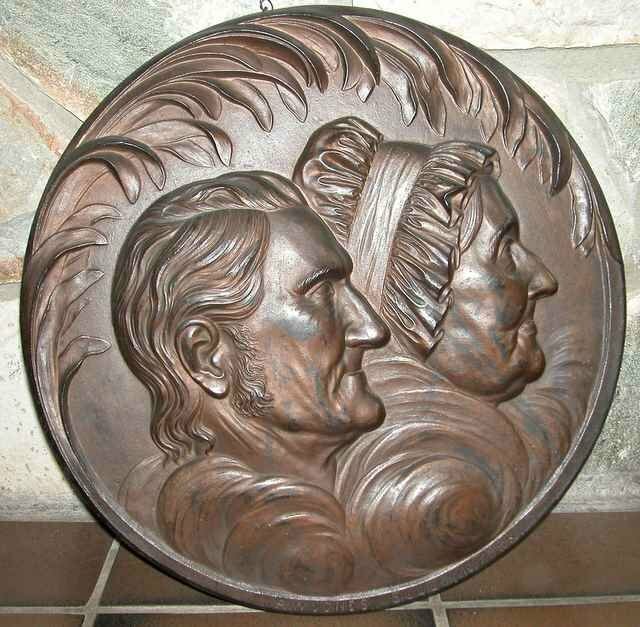 Sometime between 1855 and 1860 Anthony W. Jones also completed a relatively small 7 & 7/16 inch (18.9 cm) diameter copper patinated bas relief portraiture of his contemporary Charles Ira Bushnell (1826-1880) a prominent New York City attorney. That particular work by Jones is referenced and found on the web site of the New York Historical Society here and is also viewed below. Jones’ finest portraiture is a large and extraordinary bas relief created in 1858 of George Washington which measures approximately 38 ¾” x 29” x 4” deep. Several copies of that exceptionally fine bas relief of Washington were made—all bearing the inscription “AW Jones Sculp. NY Patented 1858”. Reference to a donation by Jones of a cast iron and bronze copy of his extraordinary bas relief portrait of Washington to the New York Historical Society is found here though that particular link does not, for some unknown reason, provide an image of the work donated. 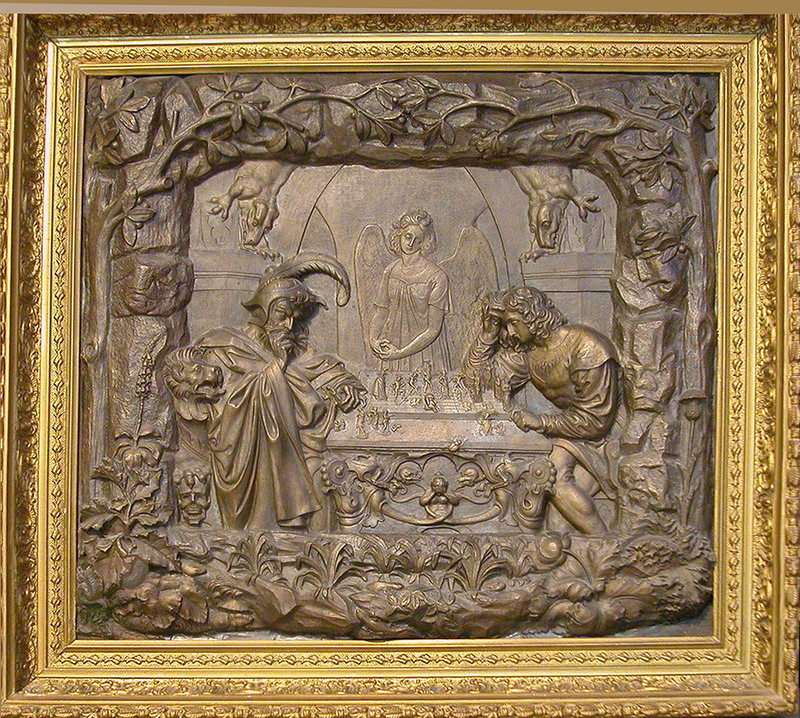 The web site of the New York Historical Society Museum & Library refers to an additional similar copy they received of that same Washington bas relief cast in iron acquired by gift from a Mr. William Dennistoun Murphy. That link also does not show a copy of Jones' Washington bas relief, again, for some unknown reason. Though the New York Historical Society web site does not display an image of either bas relief of Jones' extraordinarily beautiful portrait of Washington, the description given on their web site for both the gift from Jones and the gift from Murphy exactly match the similar large iron bas relief portrait of Washington shown below acquired by our family by direct descent from Jones through his youngest daughter Sarah. 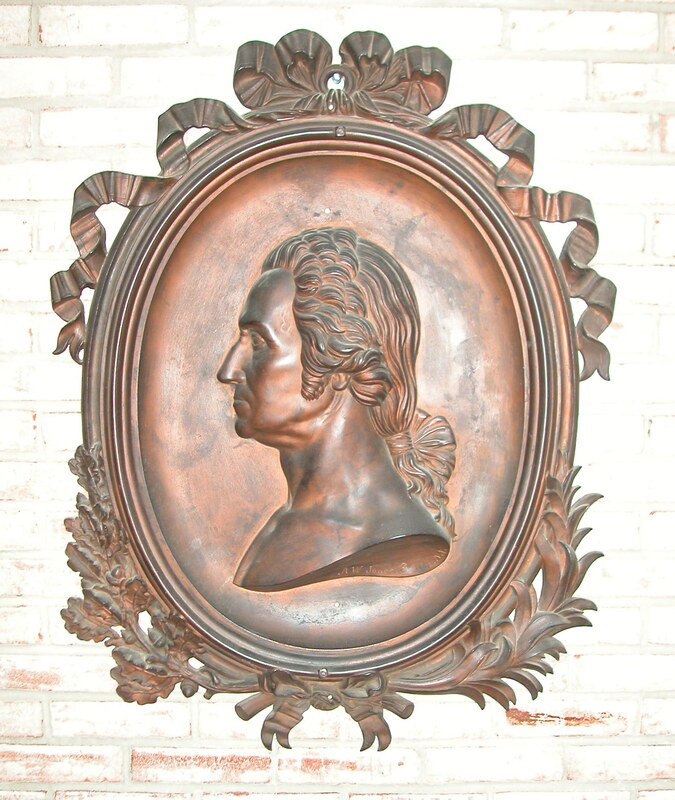 It appears that the sale in 2007 of another copy of the exact same bas relief portraiture work of Washington executed by Anthony W. Jones was mistakenly attributed to another artist with the same last name. In the Fall of 2007 The Cowan’s Auctions sold a gilt bronze medallion copy of Washington identified as Lot 19 for $3,335.00. See here. Cowans appears to have mistakenly attributed the work to a contemporary of Anthony Jones—identified as Thomas Dow Jones (1811-1881), a sculptor and medallionist also born in New York who purportedly moved to Ohio in the 1830’s. Sometime in the mid 19th century, at the height of his career as a sculptor, Anthony W. Jones created what is clearly his greatest masterpiece -- the intricate and detailed bronze bas relief sculpture of a young man playing chess with the devil ostensibly for the right to his soul watched over by a mournful but beautiful angel. We have found no evidence that more than one original of the Jones bas relief masterpiece was ever created. Until now, Jones’ bas relief has never been displayed publicly. It has been quietly passed down through the family from Jones’ youngest daughter Sara. The placement of the chess pieces on the board in Retzsch’s painting was responsible for the story of the chess master Paul Morphy’s defeat of Satan’s chess position discussed here on our web site. The Jones bronze bas relief sculpture perfectly re-creates the dramatic chess encounter with the devil though it is more difficult to discern the actual placement of the chess pieces in the bas relief sculpture. Apparently the painting or lithograph that gave rise to the Paul Morphy anecdote in Richmond Virginia made it easier to re-create the respective positions of each piece still on the chess board. The Jones bas relief was always known in our family as “The Game of Life”—a title often applied in the 19th Century by many to this stunning perpetual confrontation and struggle between man's greatest vices and his most noble virtues.